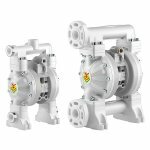 The RAASM pneumatic diaphragm pumps are designed with a 1:1 compression ratio and made to pump a vast range of fluids, with high viscosity and with solid parts in suspension. These models have been designed with an aluminium motor while the parts coming into contact with the fluid are in polypropylene. 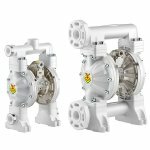 This is in order to offer a solution that can also be used in aggressive working environments with corrosive atmospheres, as well as for use with water-based solutions, detergents and corrosive fluids, while the pump continues to respect the ATEX directive. 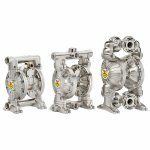 The vast range of diaphragms and valves that can be used ensure these products are fully modular and customised.